Rating batsmen in one-day cricket is difficult because both average and strike rate are important, and it's not clear how they should be weighted. I can't see a theoretical solution (multiplying the two measures might be good enough, but it seems arbitrary), and I think that the actual answer will come from simulations. In this post, I show some results from some woefully inaccurate simulations. But hopefully even though the total scores were below what they should be, the equivalences of various averages and strike rates should be reasonably accurate. Here's what I did. 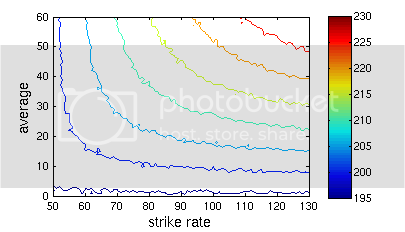 I took the overall average and strike rate since 2000 for each batting position (I think using the top eight teams). 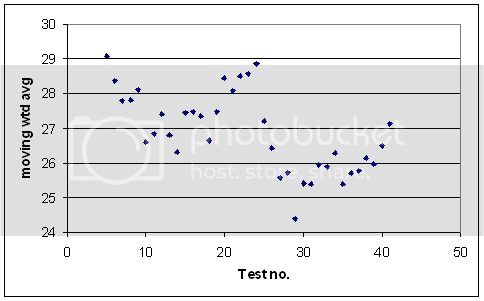 I ran a largish number (20000) simulations to get what the "average" total score is, and it turned out to be 208 (I told you it was inaccurate...). Then, I replaced one of the openers with a batsman with an average of 1, strike rate 50, then average 2, strike rate 50, average 3, strike rate 50, and so on, doing 20000 simulations each time to get the average total score. I did this until I had a grid of average total scores for strike rates from 50 to 130, and averages from 1 to 60. Then I made contour plots with curves of equal value. The simulations assumed a constant run rate and exponentially distributed scores. Not realistic, but it was straightforward to do and avoided doing ball-by-ball simulations. Because I was exceedingly lazy, the contours in the separate plots may not correspond to the same total team scores. But you will agree that the pictures are colourful. Now for some numbers. In each of the following little tables, the rows are equivalent. 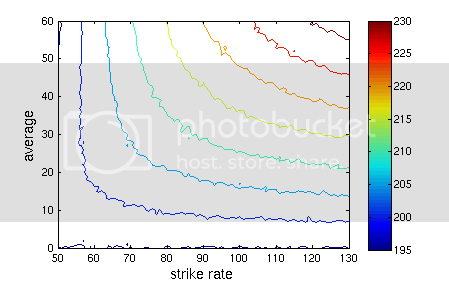 So, an opener with an average of 50 and a strike rate of 73 is worth the same as an opener with an average of 25 and a strike rate of 101. According to the simulations, at least. I didn't get past number 4. I'll do the rest tomorrow. I imagine that the curves would change with more accurate simulations, but this is at least a start. Near the end of the discussion here, there's a comment from me about the changing nature of the way runs are scored in ODI cricket. Most of it, of course, is coming from boundaries, which are much more common today. But it is interesting that there's been no real changes in the rate of non-boundary scoring since 1990. I would have thought that batsmen today are more adept at "milking" bowlers, but the non-boundary strike rate has never got above 3 runs per over for any long period. Bangladesh are really bad at working the ball around for singles, etc. There's a clear gap between Australia and Sri Lanka, then a gradual progression down through to Zimbabwe. Then there's a huge dropoff to Bangladesh. India are a bit of an anomaly, with their high overall strike rate coming more heavily from boundaries than the other teams. It's probably not just a factor of their grounds — opposition teams in India have the highest non-boundary strike rate of away teams anywhere. Top eight sides since 2000, individuals, average at least 30, at least 1000 runs. Symonds and Dhoni are best known for their hitting, but they're good at the less flashy stuff as well. Unhonourable mention goes to Chris Gayle: overall strike rate of 80.3, non-boundary strike rate of 37.3, lowest of all the players who made the qualification. Lazy. There was a comment from Gary Naylor here saying that Monty Panesar should improve on his average of 32 as his career goes on, since he'll learn more about how to bowl. I'm not convinced. I took all spinners with 149 or more wickets since WWII, and found split their wickets into which Test it was in their careers, so I could find the overall average in debut Tests, second Tests, third Tests, etc. 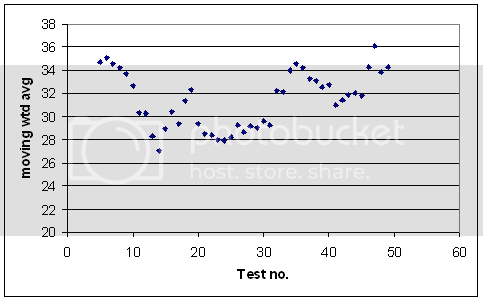 To get rid of some noise I actually took a five-Test moving average, so the first data point in the graph below is the overall average in the spinners' first to fifth Tests, the next the average in their second to sixth Tests, etc. Also I weighted wickets by the average of the batsmen dismissed. Note that there's a bit of a selection effect going on. I'm only looking at spinners who were good enough to play enough Tests to take 149+ wickets. 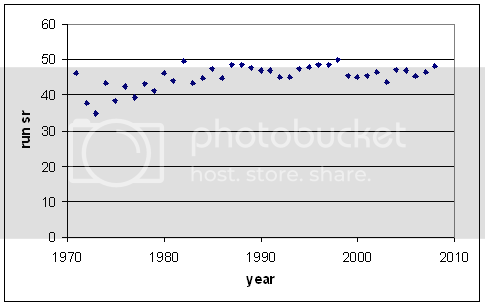 Towards the right-hand end of the graph this is also a factor — if you imagine it continuing further on out, you'd eventually just be plotting Warne, Murali, and Kumble. There are, for those interested, 24 bowlers going into Tests 1-36, then 23 in Test 37, 22 in Tests 38-43, 20 in Test 44, 19 in Tests 45 and 46, and 18 in Tests 47-49. I don't know how much I want to read into the graph, though I'm happy in saying that spinners improve after their first ten Tests or so. After that there may or may not be a trend — batsmen working them out? Certainly there's no strong evidence that Panesar will improve significantly (he's played 33 Tests), though of course it's possible. There are 46 bowlers going into all of those data points. There's a downward trend — pacemen tend to get better with experience, at least for a few dozen Tests. One thing to try in future is age rather than Test experience. The people who've done this sort of analysis in baseball say that age is a better thing to use than Major League experience. But of course baseball is not cricket, so I'm not sure what will come out of it. People often complain (myself included!) about the lack of tour matches these days. That it's such a neat little increasing sequence is probably luck. That the home side is winning more Tests is not surprising, since we're in a very result-heavy era. But the main point to take home is that there's no evidence that touring teams get better as they get more used to the foreign conditions or whatever. Perhaps those stingy boards are right not to schedule extra tour matches. This is a result that surprised me.